The best Rocky film of the series, this one is the ultimate with Rocky taking on the biggest bad guy in the most extreme venue imaginable. 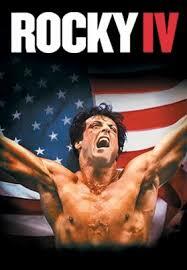 Rocky IV is a terrific film that features our title character in his biggest fight yet. This is the movie where Rocky represents america and has to go overseas to russia, just to get vengeance on the guy who killed his best friend. It’s taking the vengeance story of Rocky III and turning it up a notch, bringing it to a whole new level. The movie features not only the baddest villain and the most extreme settings, but also some of the best music and montages of the entire series. Even the fights are handled wonderfully. Aside from an unessecary speech at the end, this movie pretty much does everything right. Rocky IV is the best Rocky film of the series for a whole multitude of reasons. It’s the movie where Rocky faces off against the biggest bad guy and does it in a place where he is basically representing America. It’s also the film that features the best music, the best montages, and the most extreme story. The third Rocky movie made some changes to the series and this follow up to that film continues with those same changes. That means more fights than were featured in the first two Rocky movies, and also some death and vengeance seeking. It all starts with us watching clips from Rocky’s last fight, taking on clubber Lang, and then seeing him and Apollo sparring afterwards. We get the song eye of the tiger, the featured song from the last movie, kick-starting this one. Then we move onto Rocky in his life, at home in his huge mansion. It’s Paulie’s birthday, and for a present Rocky has gotten him a robot maid. This is meant to be funny, but what it really does is show us how eighties the movie is. This robot is supposed to be high-tech, and yet it also feels very dated. There is a Russian fighter named Ivan Drago, (Dolph Lundreon) who is making the rounds on television, going around the U.S., and claiming that he can take on any boxer. Drago has no American fights under his belt and is totally disproven, and for that reason, Rocky’s old friend Apollo Creed, thinks maybe he can take the guy on. Apollo has been retired for some time now, but he sees this as his opportunity to come out of retirement and show the world that he’s still got it. Both Rocky and Adriane do not approve. Apollo decides to take on the fight anyway, and gets Rocky in his corner, helping out. The fight is brutal from the very first minute with the Russian coming off as more of a robot than a man (it’s no wonder that lundreon was tapped to play the robot man in the universal soldier films.) Drago destroys Apollo, and while his managers and trainers want to call the fight for their boxer’s safety, Apollo refuses to let them. The pounding continues and eventually Apollo gets one hit too many and plummets to the floor, dead. We got some death in the third movie, with Rocky’s manager Mickey meeting his demise (also at the hands of an opponent), only here, it’s different. Mickey was an old man who just hadn’t met his time yet. Apollo was a much younger guy in wonderful shape. This death hits Rocky extra hard. 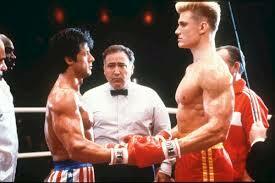 He decides that he will take on Ivan Drago, even if that means going all the way to Russia to fight him. Rocky makes this decision without ever speaking to Adriane about it, and when he gets home that night, the two of them have words with him at the bottom of the stairs looking up. She is not happy, and yells to him, “you can’t win.” that’s when Rocky storms off. At this point, Rocky starts up his car and drives away and we get an amazing montage, which features clips from every Rocky film. This montage shows us everything, not just boxing related, with lots taken from the very first movie, showing us how Rocky and Adriane first got together. The whole sequence is accompanied by the song, “No Easy Way Out,” and by shots of Rocky driving around, thinking about all this. It’s great to have such a culminating montage, showing us all of these moments, and the song fits it all perfectly. After this, Rocky goes to Russia. He has an unpleasant goodbye with Adriane, where she stands at the window and doesn’t come down to see him off. Then he, Paulie, and Apollo’s manager head out to Russia, and when they exit the plane after arriving there, are hit by the bitter snowy cold. They settle up in a cabin, which Pauli can’t believe that Rocky requested. But this is it. Rocky wants to train his hardest, no holding back, no amenities. He’s going old school. The final fight is, of course, terrific. Drago is treated like a monster celebrity here in Russia and yet Rocky manages to win over the crowd. It’s an amazing fight, with Rocky taking a beating and yet still standing tall. Even the words from Apollo’s trainer and pep talks are wonderful. Whether it’s “no pain,” or “this is your whole life here,” it’s all memorable. The movie does go on a little too long, having Rocky make a speech to all of Russia at the end, but it’s the only negative thing about the entire film. It should have ended where each of the other movies does, with the end of the fight. Still, Rocky IV is pretty incredible in every other way. It’s a very dated movie and really represents the 80s nicely with loud, ferocious music and fun little moments (the ridiculous robot at the beginning.) while Rocky II might feature the best training sequence of the series, this movie features the most incredible montages. There is even great music here that is used just as background, without being set to a montage, such as the song by the lead singer of foreigner, “worlds collide,” as team Rocky is first getting out of the plane. The music is important, but it’s one small part of what makes this film great. The movie features the most extreme villain, setting, and vengeance story. It all adds up to this being the best Rocky film of the series.